After falling to Central Michigan in last year’s Mid-American Conference tournament championship match, the Northern Illinois volleyball team completed a clean sweep in the 2012 season series by cruising to a 25-14, 25-21, 25-21 win over the Chippewas (12-11, 6-6 MAC) Saturday night at Victor E. Court. The win for the Huskies (16-12, 7-5 MAC) ended a three-match skid and extended the Chippewas losing streak to four, while also giving NIU head coach Ray Gooden is 200th career win. “I’m so happy for hour group tonight for coming back and fighting,” said Gooden, who is just the second coach in Huskie history to reach 200 career wins. Well-rested and ready to go after a tough 3-1 loss to Eastern Michigan last night, the Huskies bounced out to a quick 3-1 lead thanks to a pair of kills by senior outside hitter Meghan Romo (Valparaiso, Ind./Valparaiso). Several plays later, back-to-back kills by Romo ignited a 16-6 run to put NIU up 1-0 in the match. After hitting .500 against EMU yesterday, the Huskies hit .407 in the first stanza versus CMU, who hit just .100. In the second set, NIU faced a 6-1 deficit right off the bat but responded with an 8-2 run with help from five CMU attack errors to take a 10-8 lead. Then four more Chippewa attack errors pushed the Huskie lead to 15-11. However, CMU found the court with shots to knot it at 19-19 after a Huskie error. Unlike last night, the Huskies turned key points down the stretch as sophomore outside MacKenzie Roddy (San Bernardino, Calif./Cajon) and junior middle blocker Sarah Angelos (Waukegan, Ill./Waukegan) notched two straight kills. Following two more CMU errors, senior middle Mary Kurisch (La Crosse, Wis./West Salem) hammered down a quick, and after a CMU kill, scored on a cross-courter to give NIU a commanding 2-0 lead at the break. The final set saw the Huskies get off to a quick start again, taking a 10-5 lead after an Angelos kill. The Chippewas eventually climbed back and grabbed a 17-16 edge, but it was short-lived. Roddy fired back with a kill off the CMU block, Angelos turned in a stuff-block, and then another CMU error put NIU ahead 19-17. From there, Angelos went to work as she scored NIU’s final three points to end the match. Angelos paced the Huskies with 10 kills and a robust .455 attack percentage as she was errorless on the weekend. Roddy also totaled 10 kills and served tough with three aces. Freshman setter Alexis Gonzalez (Fresno, Calif./Bullard) handed out 29 assists and also put pressure on with her serve with two aces. 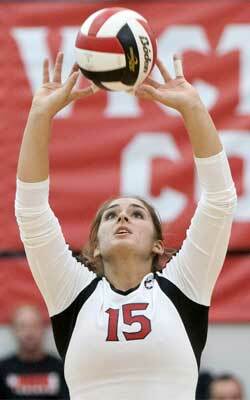 Defensively, senior libero Amber Walker (Juneau, Alaska/Juneau Douglas/Western Oregon) tallied a match-high 18 digs. NIU next hits the road to take on Toledo at 6 p.m. CT Friday, Nov. 2, and Ball State at noon Sunday, Nov. 4.